The Armadale Catholic community participated in activities leading up to Christmas Day last December. Photo: Carmen Ip. The Armadale Parish St Francis Xavier Church community took part in a series of events during the 2018 Christmas celebrations as their way of providing spiritual preparation. Among the activities organised, include daily prayer sessions, receiving the Sacrament of Reconciliation with the assistance of 23 other priests, the blessing and distribution of the four Advent candles pack, and a four week Advent Program, headed by Parish Priest Father Joseph Tran. The children dressed up and participated in the Christmas play during Mass on Christmas Eve last December. Photo: Carmen Ip. Over the Christmas Eve and Christmas Day period, six Christmas Masses were celebrated including outdoor masses held at Hilbert and Serpentine, as well as the Vigil, Midnight and Christmas Day Masses. Each of the Christmas Mass celebration featured a baby, ranging from one month to three months old, representing baby Jesus. More than 2,500 people from 40 different cultures participated in the Christmas Mass celebrations. The children dressed up as angels and shepherds and participated in the celebrations. 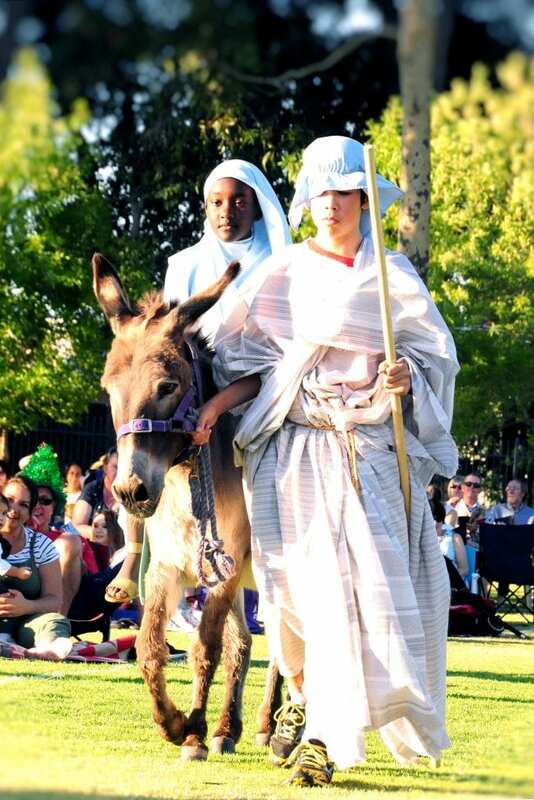 The Christmas Eve outdoor Mass, a first of its kind in 15 years, featured the dramatisation of the Gospel by the children, starting from the Angel Gabriel’s visit to Mary, the re-enactment saw her journey, together with Joseph, as they made their way to Bethlehem by donkey, only to find a humble stable where she could give birth. The dramatisation drew to a climax with the birth of Jesus and the arrival of the three wise men on camels. Other live animals involved were the release of the 12 doves, representing the 12 apostles sharing The Good News to all the corners of the world. Fr Tran with baby Vivienne who played baby Jesus for the Armadale Christmas Mass and parents Gavin and Lyhn. Photo: Carmen Ip. The dramatisation (of the Gospel) was made particularly reflective by a group of youth singers and instrumentalists who accompanied each scene with appropriate songs linked to biblical passages about the birth of Jesus. A liturgical solo dance and choreography by 14 year old Charlotte Rosman on the song, “Mary, Did you know”, was performed at the conclusion of the Christmas Eve outdoor Mass. “Every time we look at Vivienne, we are thankful that God has gifted us a child that is happy and healthy,” they said. “The love we feel for her reminds us of the unconditional love God has for us. We’ve re-examined our relationship to the church and our current participation in the parish faith at our Parish. “This has lead us to reach out and want to participate in the Christmas celebrations this year,” the couple added. Baby Aidy was one of the babies playing baby Jesus for the Armadale Christmas Mass. Photo: Carmen Ip. The congregation attending the 9:30am Christmas Day Mass, began the celebrations by singing a number of carols. After Mass, the young ones were greeted by Santa Claus who was seen arriving at the church oval in a helicopter, to distribute presents to the children. Father Joseph Tran said he also welcomes feedback from all who attended any Christmas Eve and Christmas Day celebrations at Armadale Parish to build on the community coming together in celebrating the birth of Jesus.